Why is it that a new project is always more exciting than an old project? So many people suffer from “shiny object syndrome”, and I get it! Old projects can become stale and less exciting…even if they are making money. 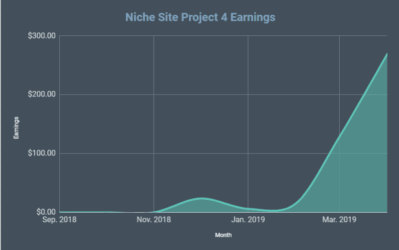 For example, if you have a niche site that has been making $1,000 a month for over a year…it's no longer a novel idea to see it earning $34 a day. That becomes the norm. However, if you have a new site that usually only makes $1 or $2 a day, and suddenly it starts bumping up to $15 or $20 a day…that is VERY exciting! Even though the new site is earning less than the “old” site, I suspect that you would react just like me and be more interested in growing the newer site. I'm not here to say whether that is a good or bad reaction, and I certainly am not one that is going to be able to resolve your “problems”, because I share the problems with you. I do want to share some of my own recent success and excitement with you! I've been working on a niche site for the past 4 to 5 months, and it's really starting to take off nicely. In fact, I want Jake and Perrin to get in on the action as well, and will be sharing their recent niche site success stories. I hope seeing a couple of cool screenshots will motivate you. Since we are going to be coaches for NSP 3, I think its important to know that we are having RECENT success. So, with that, let's jump into the screenshots and why this is all relevant to Niche Site Project 3. If you have been paying attention, you will remember that I highlighted briefly a few sites taking advantage of long tail keyword traffic in a recent blog post. In that post, I shared a few details on a site built by Perrin, one built by Jake, and one built by me. I want to give a quick update on those sites with updated traffic screenshots. All 3 of us are seeing some serious growth, and we are all using very similar tactics. Bottom line is this stuff works, and we are excited to share it with you during the Niche Site Project 3. When I say “I built” this site, I mean in a managerial role. Perrin has been doing most of the leg work based on my instructions and ideas. So, I have to give props to Perrin for really handling the day to day grind on this one. But I pay all the bills, so I get some credit right? This site was started right around August 1st. The purpose of this site was as an extension of my Amazon FBA business. I'm currently selling 5 products on Amazon, and this site was built in the same niche to attract traffic outside of Amazon. 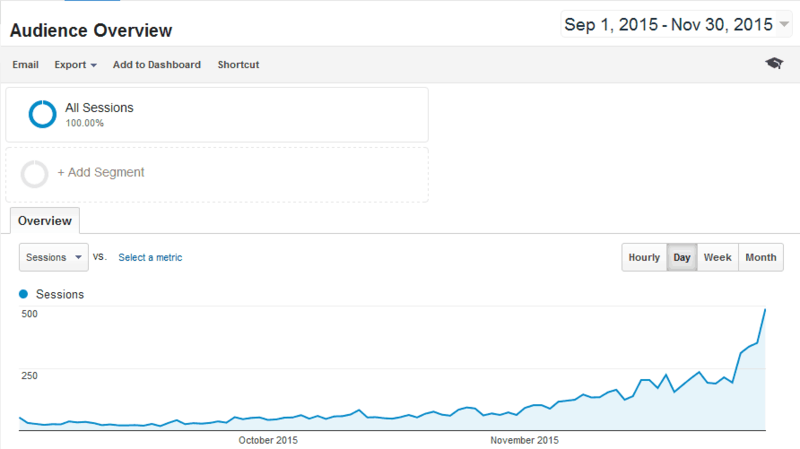 The traffic growth since October has been awesome, but the last week or so has really just taken off like crazy! 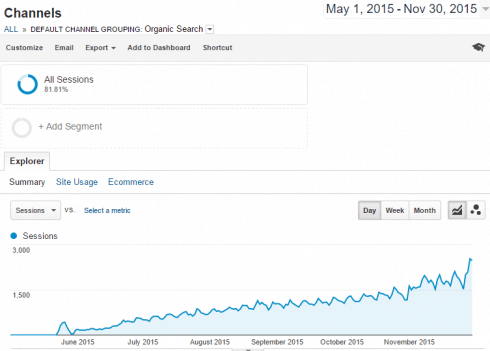 (And to be clear, about 80% of the traffic is coming from organic search). I also earned quite a bit with my Amazon FBA products. But I don't want to lump all of that earnings in with this site, as most FBA sales came directly from Amazon. The site has just exploded the past few weeks, and the reason is obvious. In mid-October we started posting lots of content based on really low competition / long tail keywords (found using Long Tail Pro of course). That content is getting indexed and ranked in Google…and I only expect the traffic to grow as we add more content and the site ages. No big secrets, just great content based on REALLY low competition keywords. And I guess that IS the secret, really low competition keywords…even if they get searched for less than 100 times a month…can bring in great traffic. Jake is a guy that definitely knows what he is talking about. He has built lots of successful niche sites, and the success below is only the most recent one. He's very well experienced, and anyone would be lucky to have him as a coach. This site has grown to about 3,000 unique visitors a day! This is a domain that Jake had sitting around for almost a year before he really did anything with it. Then he started to post content based on really low competition keywords around June or July. The best part is that he has done no link building whatsoever outside of posting a few things on Pinterest (if that even counts as link building). Earnings: The site earned right around $1,000 in November. Congrats Jake! Perrin has been busy in his spare time building out a niche site that is seeing some awesome recent success. So much success in fact, that this new site is ready to eclipse what aPennyShaved.com was earnings at its peak. In fact, this screenshot shows ONLY organic traffic. So, he is actually getting more traffic than is show here from other sources outside of search engines. After just six months of working on the site, it's already grown to nearly 3,000 unique visitors a day from organic search. Well done my young student, well done! Earnings: The site earned just over $3,000 in November from Amazon Associates. Bam! So, what's Perrin's secret? Well, all will be revealed during Niche Site Project 3.0. Actually, the general strategy is exactly the same as Jake and I have taken. Target really low competition keywords and create great content. Perrin has focused on link building a bit more than Jake or I have, but he isn't doing anything crazy here either. Just reaching out, connecting with other bloggers, and getting links on relevant sites. We'll definitely talk more about link building during the Niche Site Project. In a world of SEO that is constantly changing, I think it's important for me to show that what I teach still works in today's world. In order to do that, I think it's much more effective if I can show you examples of sites that were built recently and successful, than if I were to talk about successes I had back in 2011 or 2012. I actually DO think there is value in learning from successful people and businesses, no matter when that success came. However, with SEO and niche sites where strategies can be changing more frequently, its always nice to see more recent success. Jake, Perrin, and I are actively working on sites that are growing and earning money. Hopefully, we can pass some of these skills on to you as you read the niche site project. We are no longer accepting applications after 12/2/2015. So, if you try to submit your application on 12/3 or later…it's too late. As I've watched a few of the videos, I've been truly humbled and thankful to see how many sincere applicants there are. I really didn't know what to expect when I opened up the application process. The videos that I've seen are from people that truly want to build a business for themselves and a better life for themselves and their family. I'm starting to feel the pressure! But I'm excited to take on some students that truly do value the process, like I've in some of the video applications. I submitted my own video just as a thanks to everyone that has applied. Now that the application process is closed, we are going to take about a week to digest all the videos and start narrowing down the finalists. So, if you submitted an application, you won't hear from us until about Decemer 9th or 10th. At that point, we can let you know if you made it to the next round. We will then have a round where the Niche Pursuits community can vote on the top 10 videos that Jake, Perrin, and I have picked out. We'll be making decisions based on your votes. This video finalist round will start around Dec. 9th or 10th…I'll keep you posted with more details. Overall, I just want to thank everyone that is following along with the 3rd Niche Site Project! 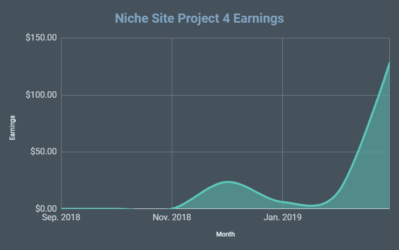 Jake, Perrin, and I are seeing some recent success with our own niche sites as shared above, and we are excited to share more about what's working. Thanks for the update Spencer! Love posts like these. You three are killing it. Good luck choosing the finalists. Thanks Danny! It won’t be easy, but I’m actually looking forward to hearing from and getting to know applicants a bit better…will be a big task this week! Any plans to make LTP cloud-based? Please may that NEVER see the light of day! It’s one of the reasons why I use LTP – the ability to know where to look when things don’t run smoothly. Cloud-based like Keyword Canine and having to “wait until someone comes around to fixing stuff” when you need a keyword at a ridiculous time… Nah, I’ll stop using and definitely stop promoting LTP (it’s happened with Keyword Canine). Great to see all this success! Can’t wait for the project to begin! The real reason im writing this comment though….. I see a traffic spike in all 3 screenshots you provided in this post and im seeing the same in my own sites. From November the 23rd one of my sites went from 300 to 500 visitors a day while another 1 that i negleted went down the same day. Have you heard anything about a Google update perhaps? Yep, the FBA website is getting commissions from other product reviews outside of my own. There have been rumors than Penguin 4.0 was supposed to come out before the end of year, perhaps that is going on? I really don’t know though. Hmm I am wondering Spencer, how many attempts did it take you to make that video? I am excited to follow along in NSP3 and hopefully be a part of it as well! I am concerned about one thing though, it seems that the overall choice in regards to who is picked will be massively hedged towards those who have ‘good’ videos…do you think this is the best way to do it? We are NOT making all final decisions based on the videos. 1 applicant may be chosen based on video (from the NP community). The other two will be 100% decided on by Jake, Perrin, and I based on entire application. We don’t care about the quality of video, etc…writing skills are actually much more important than how people look on camera. That’s why we had the written part of the application. So, video quality has zero bearing on our decisions. Thanks again for this great opportunity.I get half of my answer in your reply to Will Question.You mentioned that “writing skills are actually much more important than how people look on camera”.Video and writing skills only? This makes me think i really need to buy long tail platinum.. low competition keywords then write great contents. may i know how many words per article or review page you write ? Of course you do :). 1500 words is a typical article. Most of the articles on NichePursuits.com might fit that criteria :). Nothing magic. 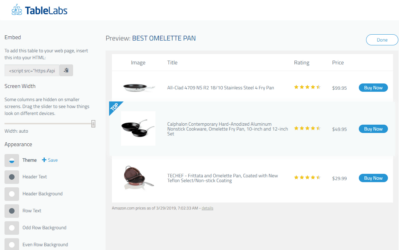 Long Tail Platinum is the most useful software we have purchased next to Easy Azon. Well worth it. I recently purchased LTP after doing about 3-months of research for the tools I would to launch a niche marketing hobby. I spent about a solid week researching keywords and seem to have come to the conclusion that it might be better to target low-competition keywords that have less than 1,000 searches for month. It seems that all of the blogs are saying that 1,000 should be the minimum but from countless hours on LTP, it seems that those keywords already have authority sites ranking on the first page and have average competition scores starting in the 40’s. Naturally, I am happy to see this quote in the article above eluding to similar conclusions I have made from my own research. I go REALLY low with mine. If I see a strong keyword, I basically just check to make sure the search volume isn’t zero. But I target dozens of keywords with a search volume under 100. Thanks for the insight. Sounds like I should tweak my strategy significantly, but I am actually glad to read this because most of the keywords that I feel would be more natural to create content about are the lower volume results from my searches, while the higher volume results seem to be more weirdly worded or less related to the topic than I prefer. Spencer said you were doing link building more thatn they have, and connecting to bloggers. May i know if you still do blog commenting? or purely outreach and broken-link link building ? And what is your competition target. Under 25 or in the teens? I have been wondering the samething and came across to what Spencer and Perrin were doing with their sites. So I setup an experiment targeting a low competition keyword to see how high it would rank without building any backlinks to that specific page. As it turned out, the page started ranking on page 2 within a week for that target keyword and has been stable on page 2 since. With a bit of push such as internal linking and simple backlink building, it might jump up to page 1. That would be another experiment I am thinking to try. Here is the case study in case you are interested. Thanks for the information. I will have to check out your link to learn more. This is not really a new development, but I have taken it to a new extreme. I always used to target my primary keyword over 1000 searches, then all my secondary articles would target keywords between about 200 to 1000 searches per month. One of the difficulties in looking at search volume is that with all the related long tail keywords your audience could be much higher. For instance, the landing page for our #1 keyword gets over 800 visitors per day. However, the search volume for that buyer keyword is under 400 per month. I have no idea where all the traffic comes from but there are a lot of related keywords. So I would look for low competition over quantity. Also, the average price for the items in this category is only around $40. So don’t get hung up on high priced items when you are starting out. As our authority grows we are now adding more expensive products to the mix. I’d be really interested in hearing how “big” these sites are. How many 1000 word+ articles do they contain? The sites are still growing and so I expect that each of them will end up with several hundred articles each…that’s the idea. As long as the site continues to grow, continue to add content. Right now the sites have anywhere from about 40 to 150 articles each (ballpark figure here). Thanks for giving us an indication of the size of these sites content wise. Time to put that new Lifetime Longtail Pro subscription to good use and increase the volume of content on my sites. I’m seeing similar trend with my site. It’s taking off now! The formula to success is very simple actually. Awesome, glad to hear that Tung! Yep, that formula looks about right! Great to see your site is taking off Spencer. One thing to point out though, since it is the holiday season, the spike in traffic is most likely due to seasonality factors. I am seeing the same trend with some of my sites and it makes me excited but when data is available to compare Year over year traffic pattern would always bring me down to earth. Nonetheless, increase in traffic is a good thing but attributing to the right reason is always helpful from business standpoint. Agreed. November’s been my highest month so far apart from January and February even earlier this year. December should be peak for me. Perhaps, and that’s just fine. The trend from Sept to now though is all growth, and that’s the bigger takeaway…rather than the sharp spike the last few days (that really doesn’t matter…its the consistent growth that’s awesome). I am really looking forward to this. i have a decent authority site that makes me some money, but its based more on a hands on community than on being an “old fashioned” authority site where i can just write content and attract keywords and views. i have ltp, i use it sometimes, but i’ve drifted from building niche sites. but im going to be working with andy slamans on some private label products come january, so i’d love to follow the exact same strategy you’ve implemented with your own products. it makes perfect sense, and im excited to see this all develop. thanks! You got me laughing when you said “this isn’t my application video”. Thanks Edward…it will be a busy week of watching videos for me. And who knows, maybe I’ll even record another one myself just for fun. Great to see an update. 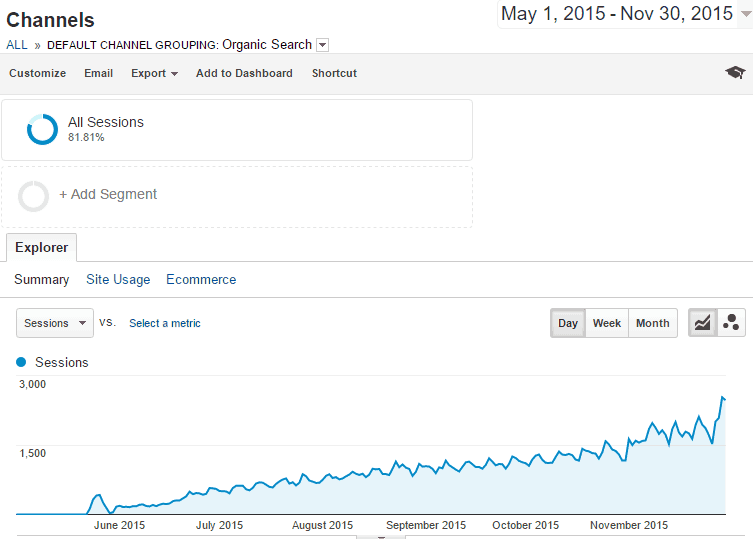 It’s amazing how you can drive that much traffic without focusing much on link building. The problems I struggle with the most is content creation. It’s really hard to find a good writer who knows what he’s doing. How do you guys go about finding a regular writer for such huge content based sites? Great post! I’m glad to see that long tail keywords still rank very easily. Looks like I’m going to have to revive some of my old domains and start posting for long tails! Thanks for the great tips. I’ll be post on my results again! Long-tail keywords with very little competition even with little monthly searches (what I call the “low-hanging fruit”) DOES work! Thanks for continuing to inspire us to keep pushing, my friend Spencer! I am in that boat where I had a site making only a few $, now it’s doubling month by month and it’s exciting to watch! I noticed my earnings & traffic took a dip after Black Friday, have you noticed the same? How soon after you start posting new content is it being indexed and shown in the top ten of Googles search results? How much of the content are you guys writing yourself VS. Hiring it out? I am really curious about your content layouts and how you incorporate Amazon affiliate into the articles. 1. Yes, a bit of a drop…black friday weekend was higher than normal traffic. 2. Indexed right away/same day. Top 10 of google depend, sometimes really quickly, or never (we don’t rank on first page for every single keyword we target). How much do you generally spend on getting an article written and where do you find good writers these days? I’ve found it tough to find talent for less than $200/post if they’re writing more than 1,000 words these days. I want to pay fair prices for content but its hard to justify the initial investment in a site when I might need to drop like $8,000 to get 40 posts up. It seems particularly risky on a brand new venture that may not pay out much at all after a year’s work. 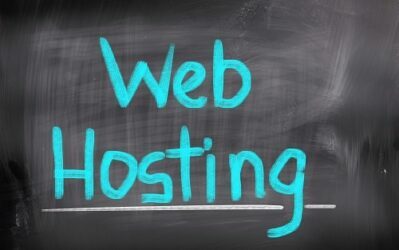 Even if the site starts earning right away it could potentially take a year or two to pay off the starting cost. Can you talk a little more about how you forecast ROI and justify the spend? I’d love to pursue the outsource only model because I don’t really have the time or the willpower to write a bunch of niche articles on my own. I would look at Upwork and test different writers. We are getting high quality product review type articles of 2500 words for $60 but it took a while to find the right one. You can’t afford to pay $200 for an article and it is not necessary. I have used writing services but I prefer to work with an individual that I can coach as we go along. I can not imagine spending $200 for one article! My budget for these kinds of sites is usually around $300 and I tend to write about half of the articles. The other half I farm out. I have used TextBroker in the past, paying $20 per. BUT, it is extremely hit or miss. 1 out of 4 articles are jems, while the others are duds. I usually end up having to take more time in re-writing than it is usually worth it. $25 to $45 an article. Those prices seem extremely low given Google’s emphasis on quality content these days. I realize we’re not trying to create Shakespeare here but in my experience paying less than .05/word tends to buy articles that are barely better than the old eHow or eZine article variety. It’s tough to build quality links to that kind of stuff. I’ve been trying to get existing bloggers to write articles for me so that I can tap into their existing fanbase and the minimum is averaging like $200/1,000 words. Maybe I’m setting the bar too high to get a site off the ground though. If you guys are seeing success, maybe the better strategy is to lowball the price in the beginning and then ramp up the budget as the site starts earning real revenue. Would any of you guys be willing to share your writer’s contact? Maybe I can throw some more work there way. Let me know and we can chat via twitter/email. I can’t agree more than this Longtail keyword strategy. I have followed Spencer since 2011.. back to Pat’s first Niche Site Duel and all Adsense goodies. I am an earlybird of LTP and life-time user. Amazon has paid me nicely so far this year because I do dig out many low competition KC keywords in LTP and rank them with niche sites and SEO. Looking forward to this Niche Site Project 3.0 and congrats those selected candidates. Thanks for much Kent! Its been great hearing about some of your success as well. Thanks for all that you guys do. Congratulations on the successes. Proud user of LTP platinum here. Amazing tool. I have shared the cool things it can do with couple of my friends and they are really excited too. I am hoping they will purchase it soon. I have a question. Targeting a root domain is NO-NO? Even though its got over 2000 local search volume and lower than 21 KC ? There is nothing wrong with using exact match domains. They just don’t provide an extra bonus like they used. Go for it if you want. For branding reasons, I like more brandable domains. Great article as always. Would you please indicate what range you use (LTP average competitiveness) as metric for low competition on average? I know you have a chart that says low competition between 20 and 30 and Very low less than 20. When in this post you are referring to “low competition” keywords, what range you have in mind (less than 30 or less than 20 or something else?). Under 30. But under 25 is awesome. Hey guys, its awesome to see such phenomenal growth and success with your various projects, I really love learning from what you guys are doing. Recently in August I stopped posting contents(have about 90+ articles on there) and switched to writing kindle books. I have about 4 books up on Kindle but growth there too is slow and painful really. The books are selling a couple of bucks a month but growing is really really slowly. Like in October I made $24 for the whole month then in November I made $27 between 3 books. I just launched the 4th book this December. Juts to be clear the site is in the romantic relationship niche and I truly wasn’t aware of just how crowded that space is if not I wouldn’t have picked that market. Now am debating whether to call it quits on that site and focus on building another as you guys bring on the new niche site project 3. My funds and time are limited so I can’t possibly work on two sites at the same time. What advice do you have me? The site is getting a handle full of visitors a day. It went from about 10 visitors a day for close to 4 moths to about 25 a day in November. Then my target keyword has climbed from 500 position in July to currently sitting on page 50. I don’t know if I will call that progress or not. What do you guys think? Thanks for all your help in this journey, it been exciting and painful at the same time but I won’t have it any other way. Thumbs up to you all! If you really feel like you’ve done everything exactly right, and its still not working; perhaps its time to try something else. I also see that just making relevant content is paying back with great search volume. Also don’t be afraid to link to other relevant sites. Even if they are your competitors. – Will I make a page of of this? – Will I make a blog post? – Will I add this content to an existing page or post? And second. With blogging, how to structure your categories and tags. Sometimes it can be really confusing how to organize stuff. I would really like to see more about this in the upcoming niche competition! Thanks for all the inspiring content. Okay, thanks for the suggestions Tim! Just wondering if the reviews on these sites are written after actually using the product or just researching about the product? We outsource all our writing and tell our writers to spend time researching customer comments in Amazon and base much of the review on what they say. That way they get a feel for the product without actually seeing it. Just researching the product. But to be clear most are “reviews of a specific product”. They usually just organize options based on price, Amazon customer ratings, size, etc. Helpful things for people looking to buy. We have a very successful Amazon authority site but have not used your targeted low volume method and are pretty excited to add this to our strategy. We use long tail pro for seeking good categories and products and of course we pick up long tails automatically but targeting adds another dimension. My question is on what the intent of the long tail article is. Are you looking for a click through to Amazon directly from that long tail article or are you going to direct them to an actual product review pages somewhere else on your site? Both, depends on the article. Some articles are obviously not related to my product; others are. Have all 3 coaches met each other in person? Just curious. Yes, at a conference this year. Hello, Spencer, this is one more article that inspired me more. I am always getting inspiration from you & your work. Thanks to each one of Jake, Perrin & you. Waiting for the Niche Site 3.0 with high voltage excitement… to learn something special. Perrin, I am especially impressed by your site. I see some of the keywords you’re ranking for, and you’re not joking — they are really low-volume! I also see you are ranking for non-monetized content on your site. Of your ~3,000 visitors per day, how many would you say are going toward your money-pages vs how many are going toward your “informational” content? As for link-building, are you still going with the guestographic technique? And then using internal linking toward your money pages, since I assume you aren’t attracting any other links to your money pages? A slightly off topic question. 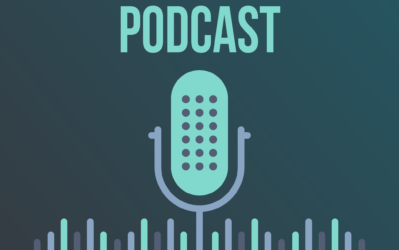 You often have guest articles/interviews with various experts in the wide marketing niche… is there a simple way for a layperson to be aware what other experts and what other courses (other than LTP university) are ‘out there’? Is there a website that focuses heavily on keeping tabs on the activities of most of the marketing gurus (including your good selves) – and the latest courses that have been launched? I am very exited about NSP 3.0 It’d be great to see how well does a niche site does in today’s market. I have a hard time outsourcing the content. I actually don’t have enough time to write the content myself and therefore i try to outsource it. I am currently trying fiverr. But the quality there is just about average. And results ( as in SEO wise ) are also just average. Although, i do hope there would be a detailed post about content and we’d learn a lot as we go ahead with this wonderful project of yours. Can you briefly tell your content outsourcing places? Do you still use textbroker? I would look at upwork but plan to pay for than you would at Fivver but totally worth it. The Philippines is a good place to look for writers on Upwork because English is their second language and prices are reasonable. One thing you can do is order a 500 work article from several different writers and see which one you like best. There are tons of services out there: textbroker, upwork, hirewriters, and many others. Its just a matter of finding writers that get the job done. i just want to thank you for all your great articles. I learned so much on this site and the articles are really fun to read! I frequently check out your entertaining site! Now that I am an LTP-Platinum (Lifetime) subscriber, I am now reading this blog regularly now and also reading all of Spencer’s emails – as well as all of the comments on each post to really learn this stuff. I am about as new as new can be to niche website marketing – just stumbled across a LazyAssStoner video about three months ago during a bored Saturday morning looking at YouTube videos on my iPad. So even from three months of research, it appears that a lot of the information I thought I was learning may be outdated information that no longer applies to pursuing niches or SEO in general. (a) – It’s OK to target keywords with less than 1,000 search volume per month. (b) – Keyword Domains may not necessarily be beneficial to have anymore? This one is most annoying because I just purchased 10 strangely-worded domains that I don’t really like, but I purchased because all of the blogs/articles I have been reading since August have stated that Keyword Domains are one of the more important facets of niche-selection. I hate to be that newbie on a forum asking those really dumb questions that everyone seems to regard as whatever101 – (pssssst: I do not have a background in computer science, programming, coding or web media). So I suppose in lieu of forking out another wad of upfront cash for a web-based training program (that would be very helpful I’m sure), should I look into buying a recently-published/updated book… something along the lines of SEO for Dummies or Complete Idiots Guide to SEO – or a more authoritative title that could be recommended? At this point, I have spent some real coin in upfront costs to pursue this thoughtfully via research software, a better WordPress page-builder, a dozen or so new domains, etc… so I would really like to hold off on spending more money until I really put in some man-hours. Can anyone provide a recommendation for a good SEO101-type book or media that would allow me teach myself this stuff?. Drew. I have a suggestion that might be off the wall but I would suggest spending quite a bit of time on Flippa looking at deals and reading Q and A.s at the end of each listing that you find interesting. See what kind of things interest you and watch the ones that do. This is great training and you can learn alot find a direction and get focused on that direction. I saw a website and business concept on Flippa that I really liked but the price was over my head at the time. 6 months later I was able to find something similar for much less and it has been a big winner for us. Once, you have a clear picture on what you want to do and where your passion is then things will start to fall into place. I always learn something from your blog posts and i am a firm believer that long tail keywords always works. I know that your most of your blog topics are about keywords and the business side. How about you give an example on how to write good and compelling article. Let say you have this keyword a,b, and c. How do you write a piece of good writing based on that keyword. I know i can learn this from your project sites, but so sad those were no longer active. I’m pretty sure I wrote a blog post on that subject, but can’t seem to recall it. Perhaps its time to do an updated version. Thanks! Spencer, you mentioned that most of the articles are 1000+ words each. Do you target just one low competition keyword per article, or bunch them together if they fit? Also, are you familiar with Chris Lee? He does things the opposite way you do, targeting big keywords bunched together in super authoritative articles. He might be an interesting podcast guest. You can often target multiple keywords in an article if they make sense. Yes, I’m familiar with Chris. Hi Spencer, Read fully your latest post. Great as the others. I would like to know the related websites of those illustrations if possible. Thanks a lot and waiting for the next article. HI Nichepursuits team! I hope my question is not too private, but i am wondering how big are those sites? Can you give us some numbers? Number of articles or a total words at site at all? A range like 10-20 or 30-40 articles will be also very helpful! And one more question: You use Amazon and your site to sell YOUR product, what about Perrin and Jake? Do they sell your product or are a part of Ammazon in classic way? How do you guys build backlinks these days? I know that you stopped using PBNs, and you target longtail keywords, but there most be SOME type of linkbuilding, right? Depends on who you asked. I prefer very minimal linkbuilding with a focus on super low competition stuff. Perrin prefers a bit more link building. Spencer and Perrin, I love this idea and I am eager to follow along and apply the lessons to my own niche site building! As well as see the growth of the students and hopefully immense success for them (I have no doubt the will find it)! I live in Colorado, as you may know Colorado and Amazon have been battling it out for a couple years of tax laws. Subsequently, entrepreneurs like myself have suffered because we are no longer able to collect commissions as an Amazon affiliate. So building a niche site around Amazon products is a bust, or I move out of Colorado! Do you have any solutions for people like me? I noticed that Ebay, and Alibaba as well as some other big commerce sites have their own partners program, but I am under the impression that they have to approve your site first. How does one build a niche site around products on a market place that may or may not approve your site. Thanks again for all your work in the niche community it has helped me out loads! Sure. Form a business in a state outside of Colorado. Problem solved. It’s absolutely amazing how much there is to learn about internet marketing. I’m still less than 6 months into all of this and keyword research completely baffled me at first. But it’s becoming more and more clear. Whenever I’d plug keywords into the keyword tool, I didn’t realize how important first-page competition was (like a complete newbie!). Long-tail keywords and how to use them is becoming clearer and clearer due to informational posts like this one. Thanks a lot for providing real strategies and helpful tactics that people can try to duplicate for themselves. I’m bookmarking your site and will definitely be back for more. By the way, I came across your website from Dom over at Human Proof Designs. Yep, I’ve been researching a lot lately. Today has been a day of mostly reading and information overload for me. It’s exciting when things start to click in your mind. Now it’s time to try to apply these principles! I’ll be starting 1-2 new niche websites soon and the more I learn, the more I look forward to the work and journey. I just bookmarked this! Keep it up Spencer, Perrin, and Jake. Thanks Bryan! So, great to hear that some of what we’ve shared is really helping. Good luck with you new sites! I am a regular visitor to your website and definitely a fan of LTP. You are doing really a nice job here. I had a question related to the topic. The first site that you showcased here in which you mentioned that you posted a lot of content on mid OCT, could you kindly update us that on an average how many separate posts were made. I am really thankful for your contribution towards us. Huge source of inspiration. I will be here following you guys. I had success too with posting content on low competition keywords. I am now on 350-400 daily visits with little links though, but my other site is beginning to build up, its on 150-200 daily visits. Adsense blog though. Secondly my main site is on page 2 of google (amazon of course) and am ready to take over. I should have been a great student of yours, but time issue wont let me thats why i didnt apply. Can’t wait to see the new winners beating Perin in regards to earning in the near future!